Our doctors at APEX Wellness Center strive to help Dallas area residents achieve maximum wellness and fitness with a comprehensive, whole-body approach. Patients looking for a Dallas chiropractor who understands the body is an intricately woven system designed for peak performance and optimal health come to our clinic seeking drug-free, alternative solutions to pain management from chronic illnesses and injuries. We also provide a full range of services to keep the body healthy; thereby reducing injury and illness events. Many people think of chiropractor services as simply manual adjustments that realign the spine to relieve back and neck pain. In reality, our doctors treat underlying conditions that prevent the body from healing itself when injuries occur. Our doctors design custom wellness programs that include corrective exercises, nutritional support, massage therapy and other services to give your body everything it needs to thrive. Chiropractic care supports your body with drug-free, non-invasive tools to achieve optimal health. Comprehensive chiropractic protocols aim to minimize pain, relieve trapped nerves and improve your quality of life. Depending on your overall fitness and health status, age and lifestyle goals, we may recommend a combination of services that include maintenance visits to support proper spine alignment and therapeutic massage, acupuncture and dietary changes. Your treatment plan may include additional services such as at-home exercises, hot and cold treatments, massage to improve blood circulation and supplements to balance your micro and macro nutrient levels. Each plan is customized to the individual. 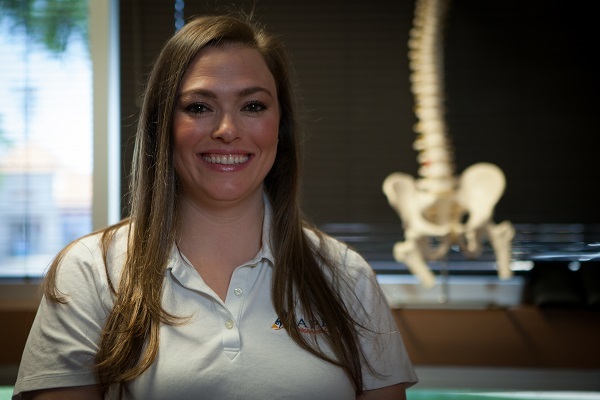 Dr. Erin Stark Calaway, founder of APEX Wellness Center, is a 2000 graduate of the University of Delaware, and a 2004 graduate of Parker College of Chiropractic. Dr. Erin is a certified Applied Kinesiologist through the International College of Applied Kinesiology. She received her acupuncture certification from the Acupuncture Society of America. She has also completed a Fellowship with the International Chiropractic Pediatric Association, and is certified in Chiropractic Pediatrics and Webster Technique for pregnant women. Dr. Erin is Board Certified by the National Board of Chiropractic Examiners. She is a member of the Texas Chiropractic Association, the American Chiropractic Association, and the International Chiropractic Pediatric Association. Every treatment recommendation has one goal, to help our Dallas area patients get healthy and stay healthy throughout the lifespan. When you schedule a visit to see a Dallas chiropractor working with APEX Wellness Center, you will first fill out a complete medical history and discuss your health concerns with the doctor. Then, the doctor will give you a thorough examination and discuss treatment plans based on what she finds during the exam. Whether you want to take better control of your health and wellness, or you have suffered an injury and need relief from joint pain or muscle spasms, we can help. Are you struggling with health problems that limit your mobility or keep you in constant pain? Take the first step to reclaim a vital life. Call 972-392-9402 to schedule an appointment with Dr. Erin Stark Calaway.